After a couple bowls of ramen that were tasty but not quite my style, I decided to go with a bowl I knew for a fact I would enjoy. 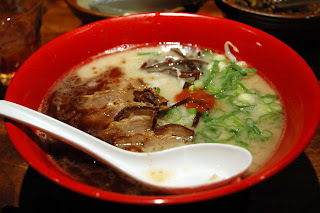 Ippûdô is a nationwide chain serving a gussied-up bowl of Hakata-style tonkotsu ramen. I remember being taken by some friends to Ippûdô for the first time five or six years ago and being totally blown away, and last time I was in Tokyo I made it a pretty regular stop for lunch and dinner. And now, as it turns out, Ippûdô is literally the closest ramen shop to where I live, barely a few hundred meters away. Perhaps because it's so close, or perhaps because I worried that I had held it in too high esteem, I had consciously avoided going to Ippûdô thus far. Now, 10 or 12 bowls in, it was time. I put on my slippers and shuffled down the block, waiting under the eaves on a rainy Sunday afternoon. Ippûdô has an amazing lunch special, where for something like 100 yen extra, you get gyoza (dumplings) and unlimited rice as well as ramen, so lines are always long, especially on weekends. If anything, Ippûdô might suffer from a bit of over-hype, as it's praises are constantly being sung, and many people who would not generally consider themselves ramen fans often eat there. 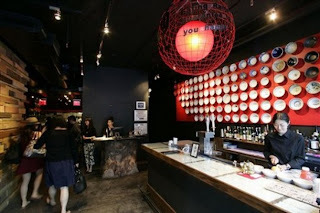 It's also expensive, clocking in at nearly 1000 yen a bowl, and was one of the first places to really succeed with the whole "ramen in an upscale atmosphere" strategy. Ippûdô recently opened a shop in the East Village in New York that is even more high concept, featuring a bar area (with a bar made of backlit dried noodles under glass) with cocktails to sip on while waiting for a table in the very chic dining room. $14 dollars plus tax and tip is a lot to pay for one bowl of ramen, but it was unspeakably satisfying to be able to get a truly delicious bowl of Hakata ramen in New York. So, after all the hype, I wondered if I could still enjoy a bowl of Ippûdô the way I used to. After the first sip of soup, I knew the answer was yes. The pure white tonkotsu broth was so delicious and creamy, and blended perfectly with the dark black mâyû (burnt garlic oil) laid on top, both visually and tasticulally. I got the richer Akamaru (versus the lighter assari Shiromaru) which also comes with a clump of spicy paste to create a red, white and black tri-color beauty, accented with crisp green onions and slivers of kikurage fungus. One of the other best things about Ippûdô is the fact that spicy takana greens and beni shôga (pickled ginger) are available tableside. I like my Hakata ramen to look like a garbage can of toppings when I'm done with it, so I layered both on heavily, and used some of the takana to eat with my free rice as well. There is also a garlic press to squeeze on fresh garlic, as well as a sesame grinder for extra garnish. This to me is what the whole Hakata ramen experience is all about - pure decadence as the strong porky soup, garlic, ginger, onion, and spice all blend together to be absorbed perfectly by the thin white noodles. I couldn't help myself from ordering a kaedama (extra helping of noodles) to get every last sweet drop of broth into my mouth. I felt disgustingly full for the rest of the day, but was relieved to discover that Ippûdô was still delicious.